New ads for House of Cards reference a now-infamous scene early in Season 2 where—spoiler alert—Frank Underwood pushes a certain aquaintance in front of a D.C. Metro train. 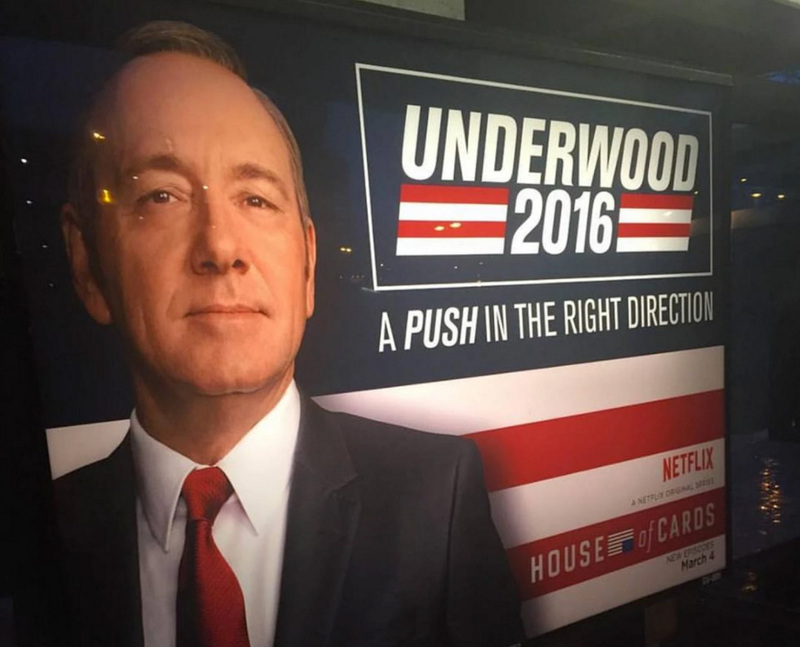 Meant to look like political ads, they depict Kevin Spacey as the fictional Underwood and the tagline, "A push in the right direction." The ads are appearing in actual D.C. Metro stations, which is darkly funny, if charmingly tasteless. As a creative decision, it feels almost negligent, given the litigious nature and open bloodthirst of many D.C. commuters. But hey, it's also a pretty clever instance of risk management. The next person who pushes someone—or gets pushed—in front of a train could point to those posters as a malignant influence and tie the Netflix show's producers up in court for a while. But D.C. Metro's numerous maintenance and personnel issues make that scenario more or less impossible. That Mr. Underwood really is clever, huh?